9am – 4pm Monday through Friday. 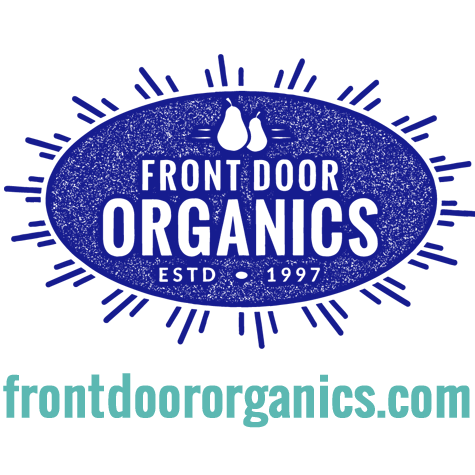 Front Door Organics is a family business, owned and operated by partners JJ Sheppard and Angela Donnelly. Serving Toronto for over 12 years, FDO has grown from a tiny seed—our first delivery was to just six homes in the High Park Area—to a dynamic enterprise with a staff of 12 and more than 800 fresh box deliveries a week. Initially, we prepared two sizes of Fresh Boxes™ with a set menu of selections, and customers could make a few substitutions on the phone. Fast forward 12 years: we now offer fully customized Fresh Boxes™ to meet our customers’ unique needs, including eco-friendly and organic groceries, primarily using web-based technology. Customers can always know what’s coming beforehand, although some people still like the fresh surprises! FDO initially emerged from the vision of Angela Donnelly. Hailing from bucolic Saltspring Island, Angela grew up working in her parents’ produce business, never guessing the blueprint for her future career was being set. After working in Vancouver at a variety of natural food stores, and organic food wholesalers (and a youthful turn at campus politics), Angela moved to Toronto to build Front Door Organics while still in her 20s. In the meantime, Torontonian JJ Sheppard began to supplement her income as a musician by working as a driver at FDO. Then — as her inventory of skills became apparent — the long-time vegetarian and environmentalist, who also grew up working in a family business, took on her current focus as FDO’s sorely-needed “general engineer” and operations director. JJ can still be found playing her horn around town in FDO’s downtime. While JJ and Angela are busy managing FDO and charting its future direction, they both like to keep a hand in the details of the business like today’s fresh organic lettuce picks. They look forward to continuing to grow the business while maintaining the company’s commitment to social justice and environmental issues.